Calling all women in social media! Join me for my first Sisterhood the Blog Twitter chat about digital sisterhood on October 6 at 9:00 pm EST. To access the chat log onto Twitter and use the #STB10 hashtag. During the chat, we will discuss our personal definitions of sisterhood, digital sisterhood connections – how/why we create and sustain them, and lessons learned from our digital sisterhood connections. Our Twitter chat stream will be used as research for my book project Sisterhood the Blog: Soundbytes from the 21st Century Women’s Online Revolution (December 2011 – click here to donate to my Kickstarter.com fundraiser for my book project. TY in advance for your support!). You can find me on Twitter at http://twitter.com/anandaleeke. Tweet with you on the 6th. Ananda’s Kickstarter.com Fundraising Update – Raised $106 towards $500 goal! My Kickstarter.com fundraiser for my Sisterhood the Blog book project is really taking off. I am blown away by the generosity of folks in my network. So far I have received $106 in donations from Tanya Fields, Johanna Vondeling, Richael Faithful, Jill Foster, Sariane Leigh, Aiesha Turman, and Kiratiana Freelon (the first supporter!). Many thanks everyone for your positive energy and support! My goal for this first round of fundraising is $500 by December 23. My overall goal is to raise $1,600 by August 31, 2011. Click here to learn how you can make a $1-$25 donation to my Kickstarter.com fundraiser. Thanks in advance for your support! September and August were great months for receiving positive press about my work as an author, artist, coach, yoga teacher, and innerpreneur. Check out the audio and blog interviews below. Let me know what you think. If you would like to interview me, send me an email – kiamshaleeke@yahoo.com. Click here to check out all of my media links from 2007 to 2010. Enjoy! Last Friday I launched my Kickstarter.com fundraising campaign to raise $500 for my book project Sisterhood the Blog: Soundbytes from the 21st Century Women’s Online Revolution (December 2011). To learn more and make a $1-$25 donation, click here and watch the video above. Also, read the Kickstarter.com fundraisier description below. Thank you for your support and positive energy! Author Ananda Leeke is using Kickstarter.com – http://kck.st/avHVlu – to raise money for her next book Sisterhood the Blog: Soundbytes from the 21st Century Women’s Online Revolution, a memoir that discusses her Internet adventures, digital sisterhood experiences, and reflections about women and the Internet. Her overall goal is to raise $1,600 to cover the cost of her self-publishing fees by August 31, 2011. She is using Kickstarter.com as her first phase of fundraising. Her Kickstarter.com goal is to raise $500 by December 23, 2010. Click on the link to support her fundraising campaign: http://kck.st/avHVlu. Ananda ‘s memoir covers the period of 1986 to 2011. It begins with her first Internet experience as a law student using the LexisNexis research service at Howard University School of Law in 1986. It also discusses the first time she witnessed the power of women and the Internet at the U.N. Fourth World Conference on Women held in Beijing, China in 1995. The memoir digs deep into the world of women in social media and celebrates the impact of “digital diva” sheroes on Ananda’s life. Ananda started conducting research for her memoir in 2008. She used her WordPress blog, Ning.com social networking site for women of African descent, Facebook groups, Twitter accounts, and Talkshoe.com radio shows. Since then, she has created a logo for the book and used her DC Social Media Examiner column, Flickr photo-sharing account, YouTube and Vimeo channels, and Cinchcast audio blog to document her interviews with women at meet ups and conferences such as Blogging While Brown, She’s Geeky, Nonprofit 2.0, Social Justice Camp, Crisis Camp DC, Social Commerce Camp DC, DC Media Makers, Social Media Club of DC, Latinos in Social Media, BlogHer, and Blogalicious. In 2010, Ananda began using Survey Monkey to collect data on women’s Internet experiences (http://www.surveymonkey.com/s/PLWQ72K), interviewing women on Blogatique with Ananda Leeke on BlogTalkRadio (http://www.blogtalkradio.com/anandaleek­e), and organizing monthly focus groups on women in social media via Eventbrite (http://www.eventbrite.com/org/505029633­…). She uses Sisterhood the Blog Radio on Talkshoe.com to host the online focus groups: http://www.talkshoe.com/tc/42015. She facilitates the DC groups at the Martin Luther King, Jr. Memorial Library in Washington, DC. She is co-leading a community discussion about digital sisterhood at the Blogalicious conference in Miami in October: http://blogaliciousweekend.com/2010/0… Her research efforts will end in March 2011. She plans to finalize the book draft, create the artwork for the book cover, and complete her Kickstarter fundraising campaign by Summer 2011. The book will be published by iUniverse, Inc. by December 2011. September 11th was a pretty special day for me this year. I spent the entire day at a wellness workshop sponsored by Smith Farm Center for Healing and the Arts at Allen AME Church in Washington, DC. During the workshop, I taught a short kind and gentle yoga class for African American DC residents. 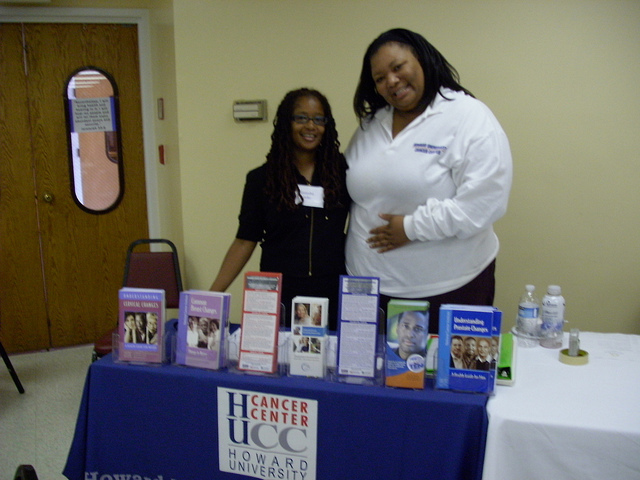 I also had a chance to connect with Howard University Hospital’s Cancer Center representative. We had a great time talking about the work of Smith Farm artists-in-residence at Howard University Hospital. By the way, I worked as artist-in-residence at Howard Hospital from 2003 to 2009. Great times! Click here to see more photos from my adventures at the wellness workshop. National Yoga Month 2010 has been a blast. 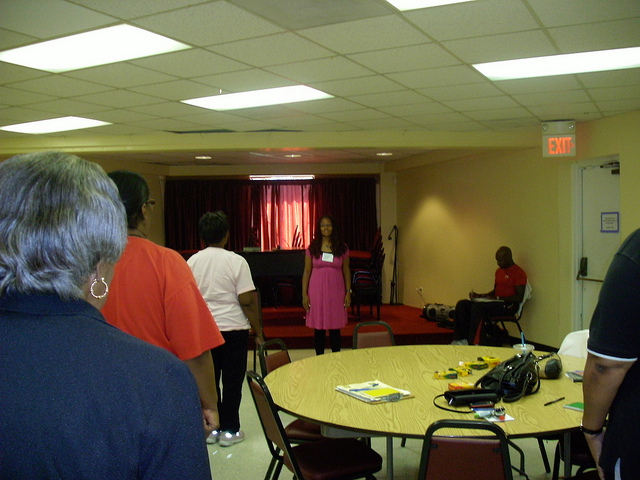 I taught a kind and gentle yoga class series on September 11, 18, and 25 at Allen AME Church in Washington, DC. The yoga classes were a part of the Healthy U Program for African American DC residents. Smith Farm Center for Healing and the Arts sponsored the event with Allen AME Church and Union Temple Church. Click here to see more photos from the Healthy U Program. By the way, I also work as a Smith Farm artist-in-residence at the National Navy Medical Center in Maryland. Visit www.smithfarm.com. 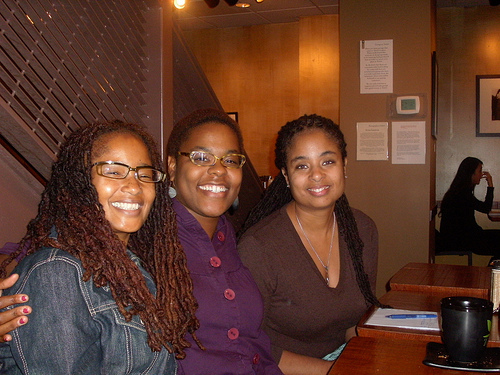 Last night I hosted the DC SheWrites.com Autumn Meet Up at Teaism (Penn Center location) in DC. Writers Evelyn Bourne (http://twitter.com/evelynwrites), and Beandria Terese (http://twitter.com/joyfullybea) joined me for tea, delicious Asian-inspired food, and great conversation. We shared news about our writing projects and traded books. Click on the link to hear our audio blog on Cinchcast: http://www.cinchcast.com/anandaleeke/97692. Click on the Flickr link to see photos from the meet up: http://www.flickr.com/photos/anandaleeke/sets/72157624939000297. FYI: The next meet ups are November 29, March 29, and June 29 at Teaism, Penn Center location, 400 8th Street, NW, Washington, DC (a block from National Archives Yellow/Green Line Metro – www.teaism.com) from 6:30 pm to 8:00 pm. Click on link for more information about She Writes: www.shewrites.com. Ananda is speaking about digital sisterhood at Blogalicious on October 8! Great news! I am co-hosting a discussion with PR guru Xina Eiland on the digital sisterhood experience at Blogalicious on October 8 in Miami, Florida. To learn more, read the blog post about our Blogalicious discussion: http://blogaliciousweekend.com/2010/09/the-digital-sisterhood-experience-at-blogalicious-2010. Calling all DC area women writers! Join me for the DC She Writes meet up on September 29 from 6:30 pm to 8:00 pm at Teasm, 400 8th Street, NW, Washington, DC (located at the corner of 8th and D Streets, NW; visible from the National Archives stop on the green and yellow line). Click here to rsvp on SheWrites.com: http://www.shewrites.com/xn/detail/3506464:Event:158115?xg_source=activity. Teaism is an Asian-inspired teahouse that infuses the cultures of tea and the ideals of teaism with the informality and casualness of America. It offers Bento boxes from Japan, curries from Thailand, and tandoor breads from India. The group will meet on the lower level. Click on the link for the menu: http://www.teaism.com/Restaurant/PennQuarterMenu7.html.